I'm very late to the party to celebrate a shiny new CASE Study. Now if you need persuading some more to ink along with us, we have a sponsor this week. Our sponsor this week is Elizabeta Kushner, with her Etsy shop! One lucky peep will win 3 digis of their choice! So very elegant, yet there is a bit of whimsy too. Awesome. really love the white on kraft...fab card Amy ! Cuteness! This is so simple and classy!! Gorgeous. So perfectly simple. I tend to stay away from kraft, too, but between you and Angeline, I might have to pull some out and get kraft-y with it (sorry! couldn't help myself - hee). xoxo! Hi Aimes!!! 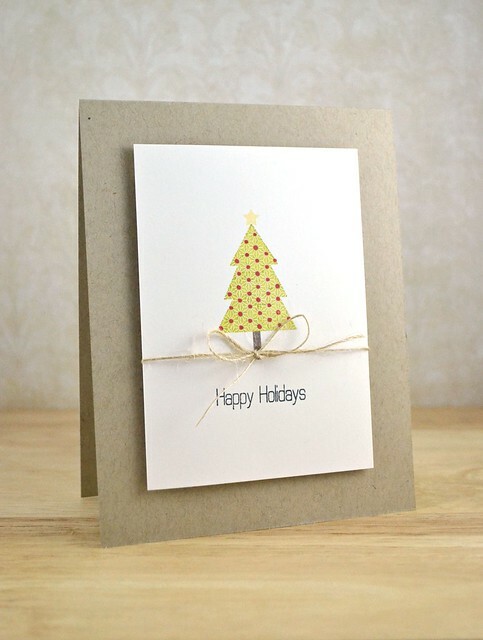 I just love this fabulous little tree card!!! CAS perfection! Perfectly clean & simple! Love the twine bow! Love this Aimes - that bow is perfectly placed! !